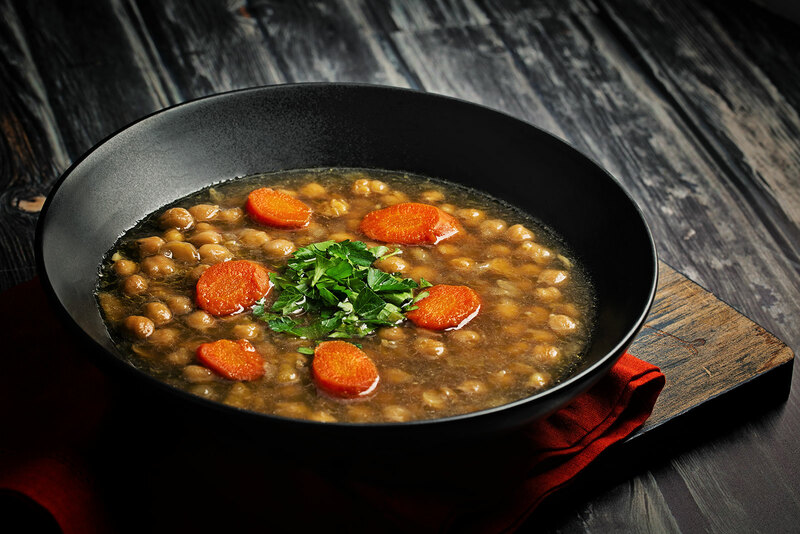 Learn how to cook chickpeas, also called garbanzos, from dried beans so good that you'll never want to go back to canned. When I lived in my old neighborhood, before moving in with my aunt and grandmother, I’d walk Starbuck, my American cocker spaniel, as soon as I got home from work which was right around dinner time. My old neighborhood was very ethnically diverse and you could guess who lived where by the various aromas of dinner preparations wafting out of front doors and down walkways of the homes we passed. It wasn’t difficult to pick out the latin households: the distinctive smell of pinto beans bubbling away on some unseen stove mingled with the perfume of tortillas hitting a hot griddle would give them away. With each whiff, I would be transported back to the yellow kitchen of my childhood, mom at the stove dishing up bowls of steaming hot pinto beans swimming in their broth to be garnished with cilantro, onions and tomatoes and sopped up with freshly made flour tortillas. I absolutely adore beans. 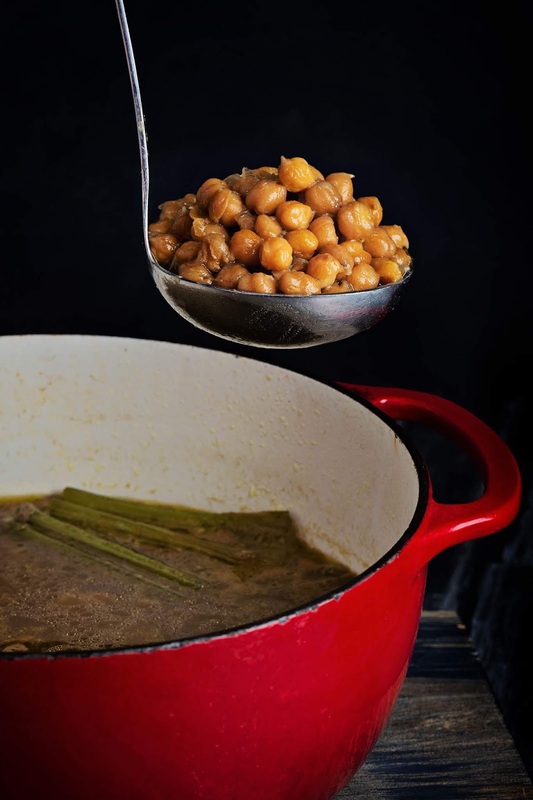 From the pintos, limas and lentils of my childhood to the cannellinni, fava and chickpeas I discovered once I was in charge of my own pantry, I simply never tire of them. These nutrient dense, low-calorie, high protein, low cholesterol powerhouses are among my favorite foods. If you’ve only ever eaten canned beans, you’re really missing out. 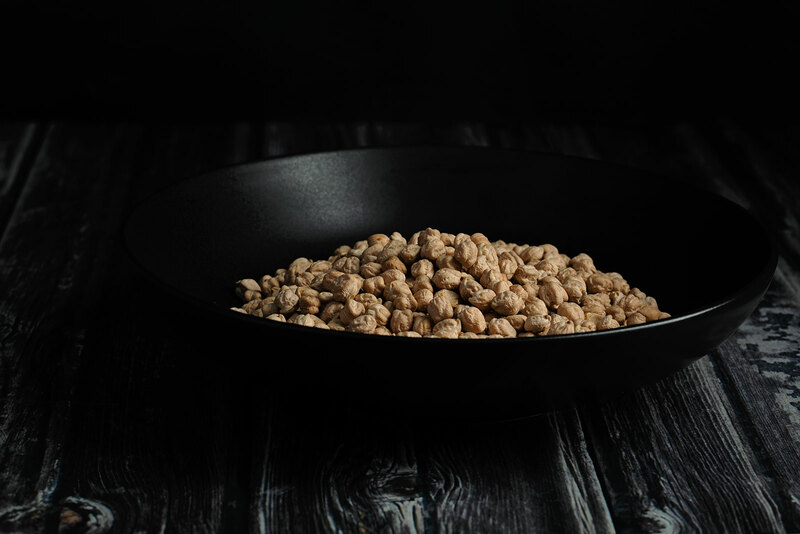 Dried beans soaked and cooked at home with your choice of aromatics is an all-together different food than what comes in a can. And in the case of chickpeas (also called garbanzo beans) it’s doubly so. My youngest sister told me not too long ago that she didn’t care for chickpeas because they were too hard but she did love hummus and falafel. So it wasn’t necessarily the flavor she was opposed to but rather the texture. 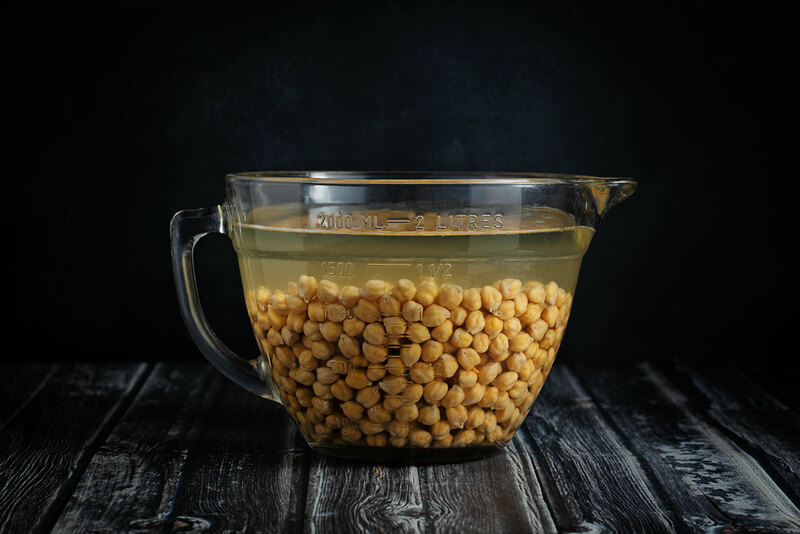 I mentioned to her then that canned chickpeas are always hard and if you’re going to eat them, they really need to be rinsed well and simmered in fresh water for at least a half hour to an hour if you want them to be palatable. But if you’re going to go through the trouble of doing that, then why not just make them from scratch and have complete control over them, cooking them until they’re tender and fragrant and absolutely nothing like their canned counterparts. I can live on chickpeas as my main protein for days because they are so versatile: thrown into a salad, scrambled with eggs and lemon zest, mashed into faux “chicken salad” for sandwiches, made into hummus, tossed into soup and if you make them yourself, you also have the wonderful chickpea broth to play with. This recipe I’m sharing with you today is my absolute favorite way to make them. I’ve been making them for years with the classic trio of carrots, celery and onions with the addition of garlic and bay leaf and a generous sprinkling of sea salt. Recently, while killing time on Bon Appetite's YouTube channel, I discovered how the addition of two more ingredients elevates this from really good to "I want to slurp up the entire pot of chickpea broth” deliciousness: lemon peel and good quality extra virgin olive oil. Oh my word. It. Is. Heavenly. Do yourself a favor and plan to eat this as a soup the day it’s made. Slice up the carrots that cooked in the broth, top with some chopped fresh herbs like flat-leaf parsley or cilantro or even mint and a squeeze of lemon with some crusty bread and a slice or two of nutty cheese on the side like gruyere or my favorite, Kellygold Dubliner Irish cheese. Store leftovers in their broth after discarding the celery. 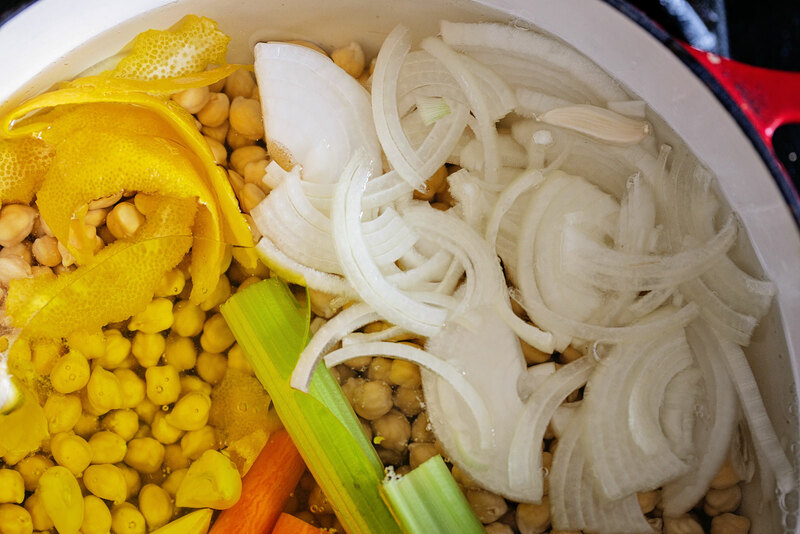 Use the beans in soups, in salads or blend it up for the best hummus (stay tuned! I’ll be sharing my basic hummus recipe next week!). Reheat the beans with their broth and toss in some cooked chicken, a couple of handfuls of baby spinach and a shake or two of your favorite hot sauce for a completely different meal. Try out new recipes like my version of musacaa, an Egyptian-style stewed eggplant with chickpeas or stuffed eggplant with chickpeas and bulgur. Really, the ideas are endless. You’ll need to plan ahead and soak these the night before you want to make the beans. I suggest soaking a minimum of 10 hours and up to 24 hours. The baking soda helps to break down the bean. To get really thin strips of lemon peel without any of the bitter white pith, use a vegetable peeler. Place the beans in a large bowl and cover by at least 3 inches of water. Stir in the baking soda and the salt. Leave on counter to soak for 10 hours or up to 24 hours. When ready to cook, drain the beans and rinse well. Add them to a large pot along with all the ingredients listed to cook the beans. Bring the pot to a boil, then cover, reduce heat to lowest setting and simmer for 1½ to 2 hours or until the beans are tender and mash easily when squashed between your fingers (the longer your beans have soaked, the shorter the cooking time; I soaked mine for 18 hours and they were cooked to tender at the 1 hour mark). xo! hope you have a chance to.